*ACID and LIGNIN. When Scrapbooking, anything that touches your photos should be acid and lignin free, including paper, glue, pens/markers and stickers. The presence of acid and/or lignin would cause the photos to discolour and disintegrate quicker than they would naturally. "A special quilt was made out of my granddaughter's favorite clothes. it is beautiful, and we needed to keep it for her when she is old enough to take care of it. 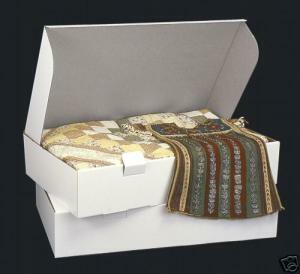 your box was in the price range we needed and the box itself, fits the quilt perfectly. the acid free paper was used to wrap her hats and dress-up clothes, and her art work. i would recommend your company to everyone that needs your products. i am very satisfied with using your company." 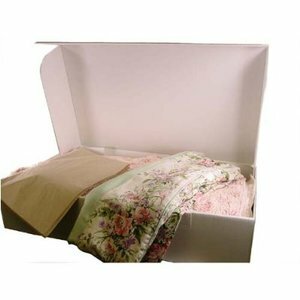 Ilene Y.
Prop-It's unique one-piece box made of white, buffered, acid-free corrugated fiberboard is the economical way to store and protect quilts, wedding gowns, heirlooms, costumes and other valuable textile items. Box includes 24 ,20" x 30" sheets of un-buffered, acid free tissue. 30" x 18" x 6" for a queen size quilt. 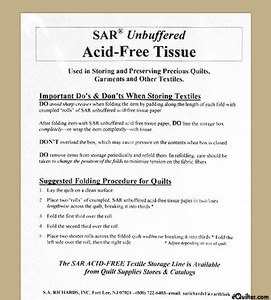 This is a SAR Acid Free Storage box that measures 18x30x6" and it comes with twenty-four 20x30" sheets of unbuffered acid-free tissue that will help protect your quilt & textiles. It can fit Queen Sized quilts. The box will be shipped flat and has instructions how to set it up. Also there are important do's and don'ts tips along with a suggested folding procedure for quilts. 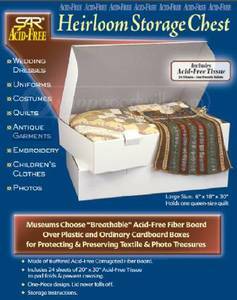 Open box with acid free tissue paper for wrapping heirloom textiles. The archival boxes are very nice but it's quite difficult to insert tabs at back of lid. Overall am please with item and transaction. Wish you used USPS for lower shipping cost. A special quilt was made out of my granddaughter's favorite clothes. it is beautiful, and we needed to keep it for her when she is old enough to take care of it. your box was in the price range we needed and the box itself, fits the quilt perfectly. the acid free paper was used to wrap her hats and dress-up clothes, and her art work. i would recommend your company to everyone that needs your products.i am very satisfied with using your company. Great item and good e mail communication on status of shipment. Great customer service, smooth and easy transaction. ArtBin 6912AB Essentials Acid Free Polyproplyene Storage Box 12X12"
June Tailor JT425 Acid Free Storage Tissue Papers 20 Sheets of 20x30"